A beautiful coastal city on the Caspian Sea, Baku is a place that I may have never known or visited if not for Formula One. Enjoy a stroll through the old town of cobbled lanes and buildings dating back to the 12th century with the backdrop of the Flame Towers (a trio of skyscrapers up to a height of 182m), which are spectacular at every hour of the day and night, and at every angle. Even the museums are works of art before you even step inside, especially carpet roll-shaped Azerbaijan Carpet Museum (close to the Asneft area of the circuit) and the uber-modern Heydar Aliyev Center. London-style black cabs are at every corner, though you are unlikely to need them because most things are within walking distance. The city is safe, even for solo traipsing at 1am. An airport transfer, booked through the hotel, was 30 Manat (€15). Before taking public transport, be sure to check schedule and route changes since many major roads are part of the circuit on Grand Prix weekend. If your accommodation is near or inside the track, be sure to investigate access. Luckily, there are volunteers aplenty to direct you to entry points but remember that English is not spoken fluently here. Similarly, pre-race customer support via email is friendly but limited. Staying connected is easy; a local Azercell sim card cost 20 Manat (€10) plus 1gb of data for 5 Manat and served me very well for the week that I was there. The people of Baku are friendly and welcoming. The cost of apartments is not at the Monaco-extreme yet, but be very careful with booking your accommodation. Use reputable hotels or apartment booking sites with avenues for dispute (i.e. the ability to get your money back should the apartment host go MIA with your money). Serendipity prevailed for me and I ended up in a beautiful little newly-renovated boutique hotel with a room directly overlooking the track just before the second corner! Who doesn’t love a bit of F1 in bed? 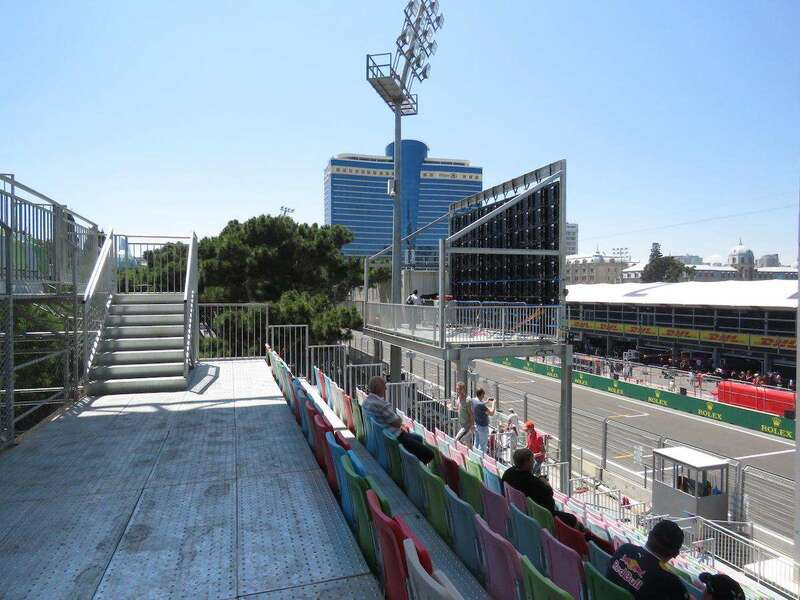 One of the most expensive grandstands, the Absheron, overlooks the starting grid, first corner and into the garages. However, it is important to keep in mind that due to the line the cars take (closest to the stand), you might not have a clear view of them at full speed down the main straight (unless of course Dan Ricciardo is pulling a triple overtake on the left!). Some official buildings also protrude further than the grandstand seating, making it difficult to see the cars approaching. After scouring the track fence line, it seems General Admission is not the best here. I’m inclined to say it is completely useless if you are actually there to see car activity. 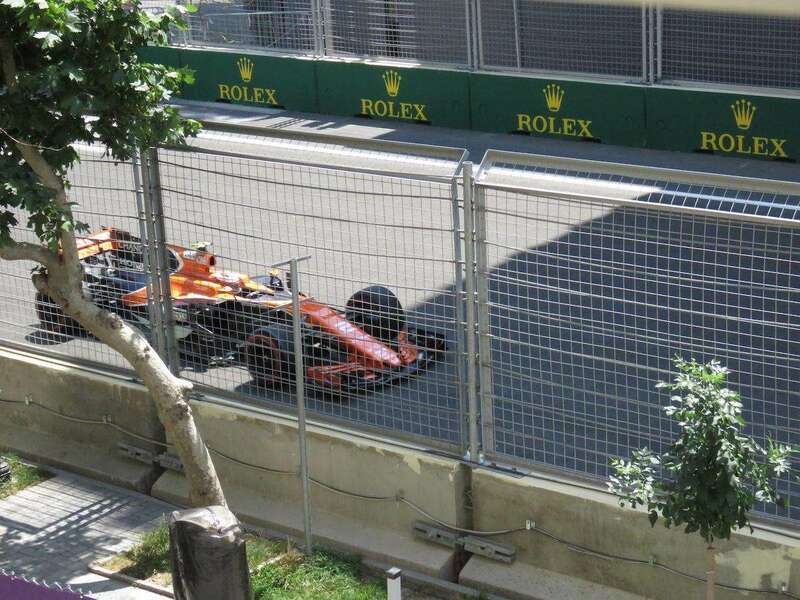 The fences along the long fast straight are uncovered and you can see the cars flying past at full speed, however the fences along most of the slower areas and corners are completely blacked out, with the exception of a small area near the Asneft stand). The Asneft stand seems to have good unfenced views and the cars slow down considerably over two corners at the Icheri Sheher stand near the Maiden’s Tower. Turn 8, where everyone clips the tight corner, is entirely covered and can only be seen by those lucky to score an apartment balcony in just the right spot. The concert line up in 2017 included headliners Mariah Carey, Black Eyed Peas and Nicole Sherzinger, plus local artists. 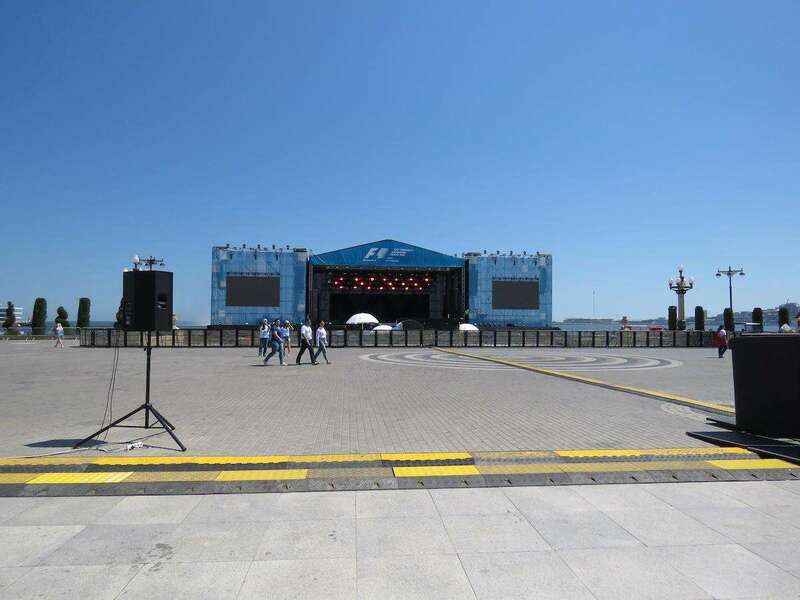 Key words: large chain-smoking crowds, an estimated 70,000+. You mightn’t be surprised to learn that on-the-go food options at the track are limited to mostly, greasy burgers, hot dogs, chips and kebabs. At least it was reasonably priced from 5-8 Manat (€2.50-4). Being a city circuit there are many restaurants, cafes and shopping malls just outside the track and even a few inside (you’ll pay a little more at these, 12-16 Manat per main on average). Water was around 2 Manat (€1) and the home made tropical lemonade (4 Manat) was the perfect cool-down drink in the heat. Be prepared for airport style security, including pat downs and even the occasional demonstration of how your camera works and how far your lens can go. The rules for entry to F1 circuits normally state that lenses longer than 400mm are not permitted, however I did see professional lenses without the professional photographer pass – could be worth a try if your hotel is not far to return it. Inconsistency in the application of the rules was an issue during the whole weekend. Your ticket might be strictly checked before entry but you will still likely find someone sitting in the aisle next to you without a ticket. Flags are not allowed on balconies and around the track but everyone does it anyway. I hung mine out the window and got a wave and smile from Kimi as he passed on the track parade. In its two years, Baku has provided us with action-packed races full of incidents and overtakes with exciting close driving. This year we saw the height of 2017’s rivalry between Lewis and Sebastian; plus of course Checo and Esteban! And did anyone escape that wall on corner 8? Baku is a new race. There are still a few areas for improvement, but I say go and check out the beauty and thrill of this spectacular city circuit. Thanks for your great site, and great trip report. I’m planning to do Baku 2019 and trying to decide how bold to be. I travel by myself (American….English only) each summer in Europe and Eastern Europe for 3-4 weeks. I’ve been to F1 at Spa, Monza, Hockenheim, and Hungary and 24h Le Mans several times on my own and been very comfortable. How much harder or easier is Baku? I’m a little uncertain about language issues, security, and just the normal travel issues in that part of the world. I will probably fly to Frankfurt so I can catch the non-stop Lufthansa flight. Wondering if I should book a tour or make all my own travel plans and just be a fan for the weekend. Thought? Thanks again! Scott, went in 2017 to this race and it was really good. No security issues and language didn’t present a problem – loved it so much I’m also hoping to get back there in 2019 if funds allow! Book it all yourself, it’s pretty simple. One thing to note,….you do need to get a visa for entry. I know they did them at the airport on landing for F1 attendees but I’d recommend getting it online before your travel and avoiding some of the queues.